Ooh neato. Now we have a battle terrain generator. Anyway, I'm pretty sure Axel would win this. 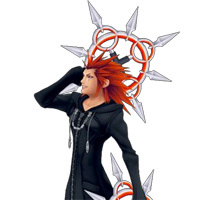 He would most likely start a forest fire which would spread very quickly on the dense forestry, intentional or not, with his fire attacks and since he has shown to be fire resistance or able to do something that gets the same result, when he lept through flame walls he made during his fight with Roxas. Meanwhile Starstlaker will have a hard time avoiding the forest fire while fending off Axel. Also, I don't Starstlaker has much defense against Axel's fire attacks from what I've gathered so one good hit should finish him. I believe you are slightly underestimating Monark in this fight. Even if he sets the forest on fire it would be at best a minor inconvenience, and if anything his shields would be more than enough to take care of any fires. The other fact is that he's basically untraceable thanks to his nanite physiology, while Monark can use Ulysses to find Axel, catch him off guard and cut his head straight off fire or no fire. If it goes up close then I don't see Axel faring any better due to Monark's more versatile equipment and skills. I know Starstalker's is a pretty obscure character so if anyone wants some scans I can post them here. Post them. I have no idea who this dude is. Some more talking about his powers, and his shield blocking a blast from a Nova Corps member. Regenerates from a blast in the stomach quickly. Ulysses cuts the head of a Phalanx infected individual with out much of a sweat. Using Ulysses to get some crazy shots in. Can extend his sword that's forged from nano-assemblers that gives it a molecule's-width edge able to slice through virtually anything. I can cook up some more if needed, the wiki as well as this page has some good info about his capabilities as well. I really don't want to have him lose this fight because of a popularity contest, and I think with the links that I provided that he should be able to defeat Axel. Yeah like totally Monark man. Yeah he should take this. Some more scans, this time from his first appearance in Marvel Premiere #32. Is able to avoid a gun shot thanks to Ulysses. Killer target skills and shows Ulysses agility. Survives an Avalanche and uses Ulysses to find his target. I don't know either character so now you've made me lean toward Starstalker. 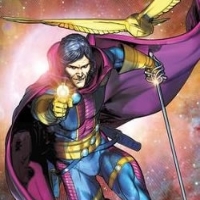 Bye the way, Starstalker is kind of like a next generation Silverhawk with that brid Ulysees. There's gonna need to be some serious arguments made for Axel to win this. He actually pre-dates Silverhawk with about 10 years, with Marvel Premiere #32 having been published in October of 1976.